Trying to manage employee email signatures across a company can be complicated and messy, resulting in display issues and a lack of brand consistency. 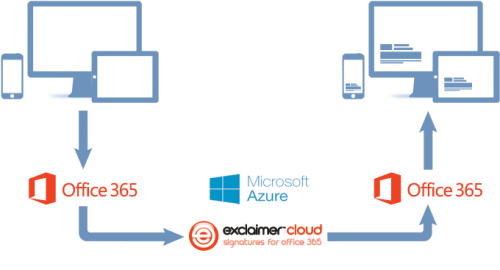 Exclaimer simplifies signature management for Office 365, allowing you to create unlimited email signatures and update them in real-time without the need for IT expertise. Choose from a library of professional templates or use a custom design, and have complete control over employee signatures. Exclaimer is an add-on to Microsoft Office 365 for Business, offering powerful signature management for business email. Offer your customers an intuitive, user-friendly signature management experience as an attractive add-on to an Office 365 for Business package. Central signature management lets you ensure the consistency and professional layout of all employee signatures, improving brand image. All users will have the correct email signature across all devices, whether using a PC, Mac, or mobile device. Update employee signatures from a central control panel, and ensure correct formatting by preventing employees from making any changes. Choose from a wide range of professional signature templates or design your own. Include dynamic content such as banner ads, social media icons and award logos to harness low-cost, high-volume marketing value of your email. Authorized users can easily create and manage email signatures through the web-based user interface, without the need for IT expertise. Exclaimer is a useful add-on to Microsoft Office 365 for Business, offering powerful and user-friendly email signature management for business. The Exclaimer product sheet provides information about product benefits, features and pricing plans. Which browsers are supported with Exclaimer Signatures for Office 365? Do you need HTML skills to design a signature? With Exclaimer signature solution, you design your signatures within a user-friendly interface. You have predefined templates, therefore, there is no need to have any HTML skills. Can I have different Signatures for Office 365? Yes. You can deploy many different signatures of different languages, for different departments, customized ones, etc. You can have different email signatures for as many groups as you wish. You can also set up signatures for individual users based on details taken from the Office 365 Directory. Can the end-user see his/her email signature? As email signatures are added after a mail is sent, users will not be able to see the signature when they compose a message. This stops them tampering with email signatures and making their own changes that might not be brand compliant. Do I have an option to have different signatures for internal and external emails? Yes. You can easily create one version of your email signature for internal emails and one for external emails. You can create email signatures with a simple design for internal users and detailed ones with full contact details when sending to an external recipient. Are Signatures for Office 365 working with mobiles? Yes. Signatures for Office 365 guarantees that all mobile devices that send email via Office 365 will have the same high-quality email signatures as desktop users. Where is Exclaimer Cloud - Signatures for Office 365 hosted? It is hosted within Microsoft datacenters, so your Office 365 email never leaves the Microsoft Cloud infrastructure. Which products is Exclaimer signatures available with? What email client software is supported with Exclaimer Cloud for Office365? What are additional features to a standard Office365 account that Exclaimer provides?